Thanks to the International Galapagos Tour Operators Association (IGTOA) and its amazingly patient support of us at Darwin Animal Doctors (DAD) for many years, we have been able to be part of a historic change in the Galapagos Islands. Recently, we were given unique permission to work alongside the Galapagos Biosecurity Agency (ABG) to bring year-round, animal vaccination/sterilization campaigns to the three major, inhabited islands of this UNESCO World Heritage site. This is the first time that animal vaccinations have been allowed continually in the Galapagos, and it is truly revolutionary. Introduced species (such as dogs) bring with them their own diseases, many of which would otherwise never have been in the Galapagos. As native wildlife has not been exposed to such diseases, it has no natural defenses or immune responses and is extremely vulnerable. Distemper, for example, is a deadly canine disease which can infect the native sea lion population. Vaccinating introduced species can help reduce the number of diseases in the environment, thereby reducing the threats to local wildlife. Put simply like this, it would seem that a UNESCO World Heritage site such as the Galapagos would have been running domestic animal vaccination campaigns for a long time. However, the situation is more complicated. Vaccinations themselves contain, in some form, the disease (or parts thereof) which they vaccinate against. Due to strict laws in place to protect the Galapagos and its fragile ecosystem, no introduced species (including diseases) may be brought onto the islands. Therefore, it has been forbidden by law to bring vaccinations (a form of disease) in. Without proof that these diseases already existed on the islands, it would never have been permitted to bring the vaccines in. So, the first step was to get proof of their existence—and enough of it to support a solid case that these diseases were definitely on the islands already. A lot of data needed to be gathered, logged, analyzed and presented in a scientific format to be accepted as reasonable evidence. Such a huge project would take a lot of work, all of which would need a lot of time. With absolutely no guarantees and no way of knowing if each effort would actually succeed to the next step, IGTOA had the faith, the foresight and the indomitable patience to help us at DAD to push through, every step of the way. This journey began nearly five years ago. Largely thanks to IGTOA’s support, we were able to secure a productive and ongoing relationship with the world-renowned diagnostic company, IDEXX Laboratories. In 2014, IDEXX donated various diagnostic tools to the Darwin Animal Doctors’ clinic. 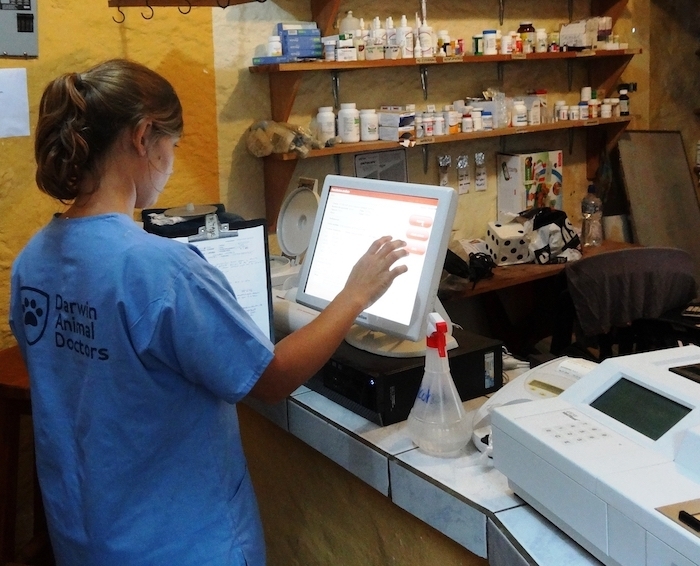 With this equipment and IGTOA’s ongoing funding for testing supplies and teams, the clinic began supporting ABG through collecting evidence that certain diseases were already in the Galapagos Islands. Gathering this evidence took years, and none of us knew if the research would reap helpful results. Thankfully, IGTOA’s faith and support never failed, and the association continued to support the Darwin Animal Doctors’ team. Through this support, we could also keep offering free veterinary services through our clinic, treating the numerous animal patients that visited us every day. IGTOA continued to work with our team to build up the capacity of the clinic, allowing us to provide more services to more animals in need. 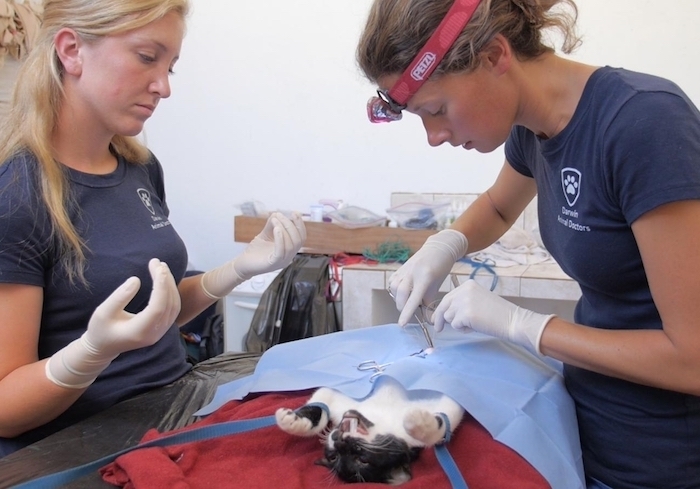 With growing community support, the clinic received increasing numbers of patients each year—those that were previously never brought to a veterinary clinic. In this way, our team was able to reach more animals and keep a larger proportion of the domestic animal population healthy, reducing the risk of diseases effecting local wildlife. Animal patients were now being brought regularly to the clinic for preventative care, such as for deparasite treatments, tick-and-flea medication and for important medical procedures such as sterilization surgeries. Thanks to the ongoing support of IGTOA, our clinic could continue to provide these services for free, ensuring that every member of the population could receive them. This meant that we could care for the domestic animals and protect the endemic wildlife in the process. All the while, we were able to use our access to a larger part of the community’s animals to test for invasive diseases and to continue working to get vaccines into the Galapagos. And that brings us to 2018. At the end of 2017, Darwin Animal Doctors heard the news that all the hard work had paid off: some specific vaccines would be allowed into the Galapagos. The Darwin Animal Doctors’ team was very happy to hear the amazing news and offered their support straight away to help get vaccination campaigns running. Due to heavy restrictions on both the import and use of vaccinations in the Galapagos, only ABG is able to store and administer vaccinations. This also ensures that each animal that is vaccinated is entered into the government database, logging their important information, including the date of first vaccination. To support this program and the progression of the arrival and distribution of vaccines in the Galapagos, DAD and our local partner NOVA Galapagos forged an agreement with ABG. In this agreement, DAD purchased and donated 1,150 vaccinations to ABG to be administered in conjunction with sterilization surgeries. It was agreed that ABG and DAD would run sterilization/vaccination campaigns on each of the three major inhabited islands of the Galapagos throughout the entire year. This agreement promoted two key goals of DAD and ABG: the humane control of the animal population through sterilization and the control of the spread of diseases to wildlife—now possible through vaccinations. Moreover, registration of animals during these campaigns is a huge step forward; not just in tracking vaccinations but also in gaining further insight into the number and condition of animals on the islands. This agreement was finalized, and DAD was given permission to import the vaccines as a donation to ABG, transported by Dr. Alejandro Rueda. Since the import and donation of vaccinations, DAD and ABG have been running the agreed sterilization/vaccination campaigns. These campaigns have been run monthly on the islands of Santa Cruz, San Cristobal and Isabela. Of additional importance, the consistency of these campaigns has allowed DAD to provide veterinary care in communities that otherwise have not had such care available to them. With Isabela having no veterinarian, San Cristobal having only one veterinarian for the large number of inhabitants and the people of the Santa Cruz highlands finding the veterinary services in Puerto Ayora inaccessible, these services are essential in controlling and treating the populations of non-native animals throughout the Galapagos. Further, DAD refers any nonvaccinated dog that comes into our clinic to ABG for vaccination. We have run 10 campaigns so far this year. There are five more planned for the rest of the year, for a total of 15 campaigns in the first year of mass vaccinations. And at the time of this writing, at least 859 animals have been vaccinated over three main islands of the Galapagos. We predict that there will be enough vaccines left to cover the remaining campaigns scheduled for the rest of the year. For years, we have had to deal with strict laws, regulations and budgets in a nearly impossible goal. But thanks to IGTOA and the amazing hard work of ABG, we have begun something that will hopefully change the fate of the Galapagos. We are only two-thirds of the way through the year, and we have still managed to vaccinate through ABG hundreds of animals, with more campaigns to come. As a further achievement, each of these animals has been sterilized and registered to further our common goals of humane population control of introduced species. Moreover, these services have been provided in areas without adequate access to veterinary care, extending our impact over the inhabited portion of the Galapagos Islands. We have strengthened an invaluable relationship with the essential government agency ABG and have worked together to further both organizations’ goals, reach and impact as never before. Finally, with ABG, we have set a new precedent that animals all over the Galapagos get vaccinated each year, in order to protect the crucial wildlife of this UNESCO World Heritage site. Images ©Darwin Animal Doctors. All rights reserved. Tod Emko is a conservationist from New York City. He came to Galapagos for the first time in 2008, serving with an international marine conservation group. While working to protect the marine reserve, Tod fell in love with the islands and wanted to ensure the survival of its amazing and important animals. He soon saw that veterinarians were in dire need in the Galapagos, where many introduced dangers threatened the local biosphere. He started Darwin Animal Doctors to fill the void and bring qualified vets to Galapagos to help all animals of the islands.